ABOARD THE PAPAL PLANE — Pope Francis is urging President Donald Trump to rethink his decision to end a program protecting young immigrants from deportation, saying anyone who calls himself "pro-life" should keep families together. 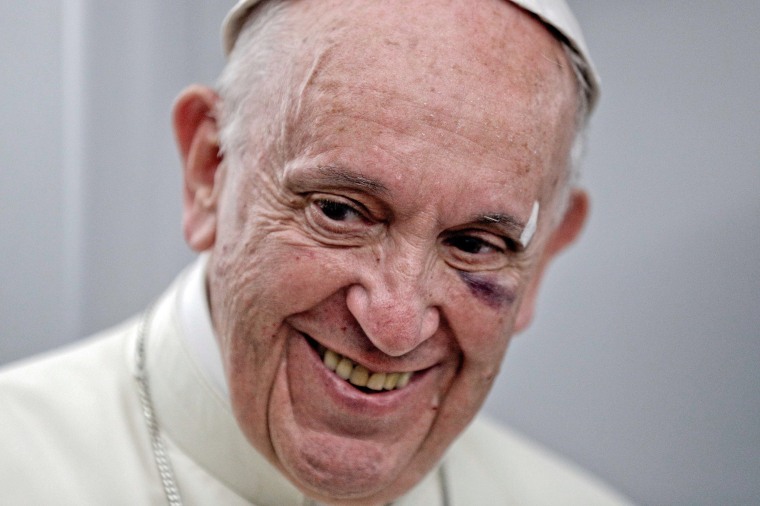 "If he is a good pro-life believer he must understand that family is the cradle of life and one must defend its unity," Francis said during an in-flight press conference en route home from Colombia. Francis said he hadn't read up on Trump's decision to phase out the Deferred Action for Children Program, which allows some immigrants who were brought to the U.S. illegally as children to stay. About 800,000 people are affected by Trump's decision to give Congress six months to end their limbo status. But he said in general, removing children from families "isn't something that bears fruit for either the youngsters or their families." "I hope they rethink it a bit," he said. "Because I heard the U.S. president speak: He presents himself as a person who is pro-life." Already the U.S. Conference of Catholic Bishops has denounced Trump's decision to end the DACA program, calling it "reprehensible" and placing "unnecessary fear for DACA youth and their families." Francis has clashed previously with Trump over issues of immigration, saying that anyone who wants to build a wall as Trump does on the Mexican border to keep out migrants is "not Christian." He has called for migrants and refugees to be welcomed and insisted on their rights to flee violence, natural disasters and poverty in search of a better life elsewhere. On Sunday, though, he also acknowledged that countries have to manage migrant flows and make sure new migrants can be integrated into society. In his airborne news conference, he was asked about Italy's new policy of stopping migrant departures from Libya, which it has achieved by supporting increased Libyan coast guard patrols and backing Libya's government in working with militias that once facilitated trafficking to now stop it. Francis said he was grateful to both Italy and Greece for having welcomed so many migrants in. But he said governments have to manage refugee flows "with prudence," taking into account how many people it can successfully integrate into its society. "I have the impression that it is doing all it can with humanitarian care to also resolve the problem it cannot take on," he said, referring to efforts to improve investments in Africa so many people don't feel compelled to leave.